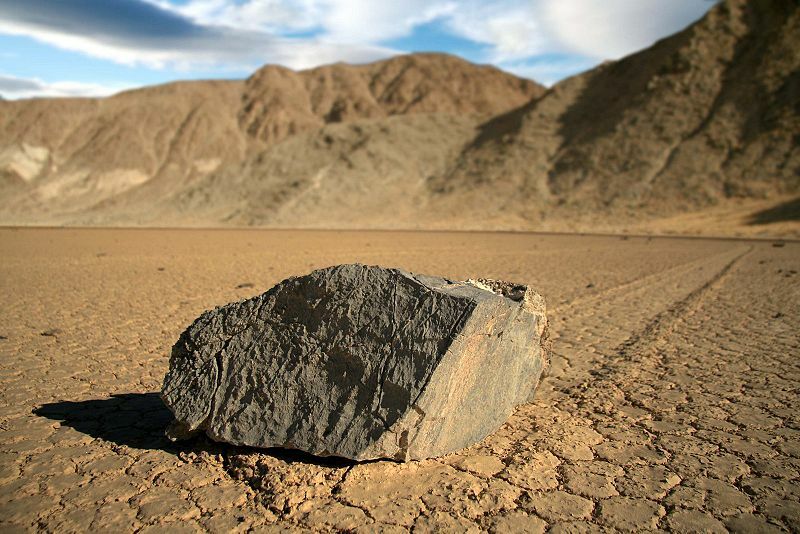 In Death Valley, California, one natural phenomenon has bewildered scientists for decades. Here rocks and even huge boulders move along the dry lake bed. The movement may be tiny – just a few inches – or more than 3,000 feet. 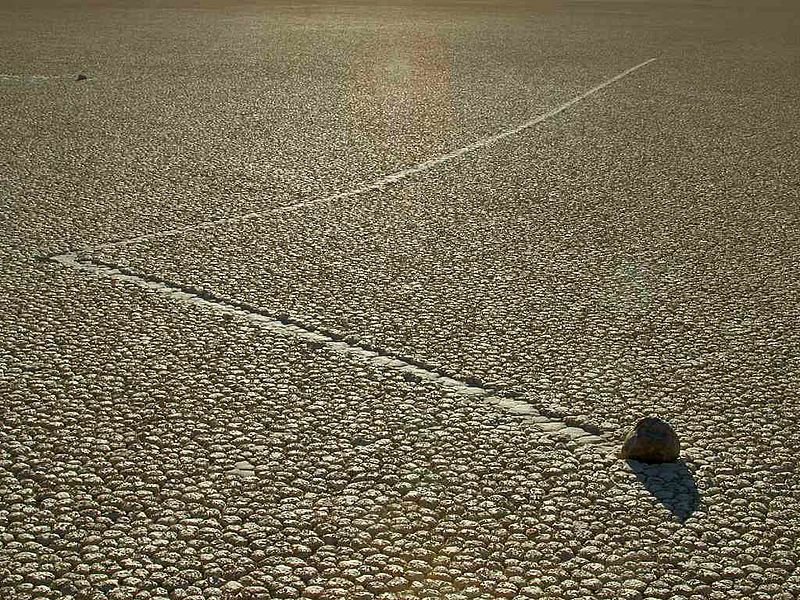 No one has actually witnessed the rocks moving through this desolate, remote region, but they leave paths behind as evidence. What is going on here? At first, scientists thought gravity might be at play, slowly moving the rocks downhill. But when they researched further, they found that the rocks were actually moving uphill, not down. One scientist, Dr. Paula Messina, geology professor at San Jose State University in California, has studied the rocks for many years. She thinks she may have discovered the reason why the rocks move. Death Valley is a place of extremes. In the summer, temperatures can soar above 120 degrees Fahrenheit. Winters are cold and windy. Dr. Messina has found that occasional heavy rains make the sediment in the lake bed very slick. She hypothesizes that high winds combined with slick conditions may be enough to move the rocks. She’s also found that bacteria grow underneath the rocks during rainy periods. The bacteria produce long, hair-like filaments, which attach themselves to the rock. This bacteria creates a slimy coating on the rocks, which makes them smooth and slippery. Because the park is protected, Dr. Messina can’t set up permanent cameras. She’s not even allowed to walk in the park when it’s wet. She says she may never know for sure if her hunch is correct, but that’s okay. She says studying the moving rocks is enough. She doesn’t have to solve all the mysteries. Researchers have studied the moving rocks since the early 1900s. Movement of the stones only happens every two or three years and lasts for about 10 seconds. Rocks with smooth bottom surfaces leave wandering tracks while those with rough bottom surfaces leave straight striated tracks. Several of the rocks were stolen in May of 2013. One of the rocks is named Karen and another is named Nancy and yet another is named Mary Ann. Karen did not move during the seven year study, but she disappeared before May of 1994 and reappeared in 1996. 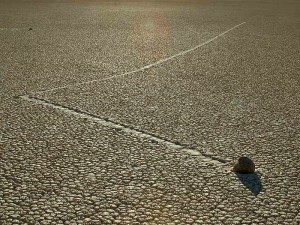 Scientists have been unable to predict when or if a rock will move or even which direction it will go. 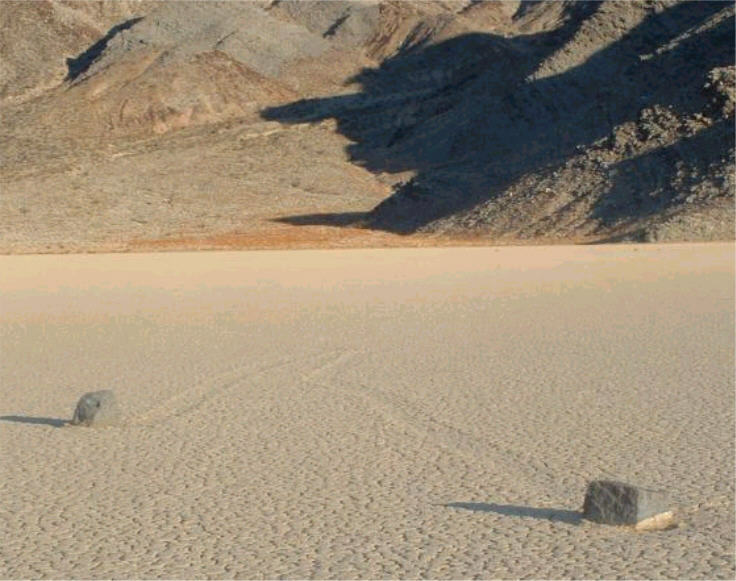 A video documentary explaining the mystery behind the Moving Rocks. Question: If access to the park where these rocks are is restricted, how do scientists prove that their ideas would work? Answer: One theory is that of an “ice raft”, where ice builds up under the rock and then as it melts wind can move the rock. To test this out scientist Ralph Lorenz created a model on his kitchen table using sand and a Tupperware container. He put sand and a rock to the Tupperware. Then he added water until only the top of the rock was sticking out of the water and froze the whole thing. Once frozen, he removed the Tupperware from around the frozen water, sand and rock and set the mass on a table. As the ice melted it Ralph could move the rock just by gently blowing on it. Here’s a map of Death Valley and all its neighboring cities and villages. Zoom in to get into street level or zoom out to see other countries around Death Valley! You can see the terrain, but also see the roads, images of the buildings and even take a 3D tour through the streets of the cities near Death Valley, as though you are actually there! Enjoyed the Free Geography Kids online resources all about the Moving Rocks info? Take the FREE & fun all about the Moving Rocks quiz and download FREE all about the Moving Rocks worksheet for kids. For lengthy info, click here.